This archive contains over 150,000 images of the sun which were acquired over a time span in excess of 100 years. The glass and acetate negatives are stored and maintained at the Pasadena California offices of the Observatories of the Carnegie Institution of Washington. The images include broad-band images called White Light Directs, ionized Ca K line spectroheliograms and Hydrogen Balmer alpha spectroheliograms. This project has digitized essentially all of the CaK. Solar images and step wedge images (available after 1962) have been extracted and identified with original logbook parameters of observation time and scan format. Browseable CaK images are available from 1915 to 1985. 39,261 CaK FITS files are available for the years 1915 to 1985. Summary listings of the radius solution results are found in each year's directory. Full Size Raw and dust&pits corrected 16-bit tiff files are in password protected directories Extracted and Full respectively. E-mail ulrich at astro.ucla.edu for username and password. Intensity files from the above curves have been adjusted to correspond to the canonical solar limb darkening curve. Summary pdf files can be found in the monthly directories. For the pdf intensity files, contours are provided at intensities of 1.10, 1.7434, 2.7631, 4.3792, 6.9405, 11.0 and 17.434 times the disk center quiet sun intensity. Flat-fielded images based on a running median filter. The procedure is described in a paper by Bertello, Ulrich and Boyden that has been submitted to Solar Physics. These files allow the calculation of a light-loss map or Vignetting function. Fits file, a brief radius algorithm description and a listing of the quantities in the summary files in each yearly directory. KEYWORDS for the fits files are explained in this file. The precise algorithms used are in the FORTRAN reduction code. Checkout Sheets for the Broadband Direct Series list the plates brought to UCLA for scanning. Sample scans from the Broadband Direct series are available for study along with comparisons to MDI images. An interesting work by Hale and Fox, 1906, describes an early application of Kenwood Observatory photographic material to the study of solar rotation. A presentation given at the AGU 2004 winter meeting can be downloaded. One version uses a 130Mbyte avi Movietone clip from 1930. A second version uses a 20 Mbyte avi of the movie clip. Both video clips are played from inside the powerpoint presentation. Anther powerpoint file used for a 10-minute talk given by Ulrich at UCLA is also available. The photographic plates and emulsions show signs of deterioration. One defect mimics solar granulation both in terms of size and intensity distribution. This defect is present on plates for all time periods scanned so far. The Laplacian filter mitigates the effect of emulsion dots of unknown origin. This defect and others can be seen on magnified sections of contrast enhanced blank sky near the sun. Storage and preservation of the plates and photos of our new Archive Lab can be seen here. This project is based on a Proposal by R.K	. Ulrich of the UCLA Division of Astronomy to the NSF to digitize and distribute images from this archive	that	was funded March 1, 2003. G.E. Hale began the photographic record of the solar surface at the start of the 20th Century when he moved the Snow Telescope to Mt. Wilson and constructed the 60-foot tower telescope. 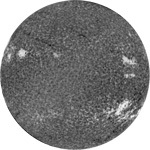 This is a sample of one of the earliest broad-band solar images in the Mt. Wilson Archive. 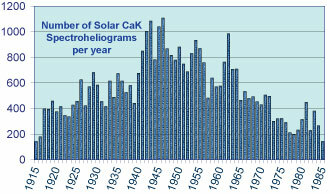 The program of Calcium spectroheliograms began prior to Hale's selection of Mt. Wilson for the observatory. The earliest plates were obtained at the Kenwood Observatory during a period between 1893 and 1897. The earliest plates are of variable quality. Beginning in 1906, several series of Calcium spectroheliograms were obtained at the 60-foot tower telescope and at the Snow telescope. Digitized forms of these images are included in the Digital Mt. Wilson Solar Photographic Archive.